Lydon Hall is, as the estate agent's brochure puts it, a house full of character. But its many interesting features should surely not include a corpse in the elegant drawing-room? Is this death the suicide it appears to be? Superintendent John Lambert and Sergeant Bert Hook are brought in to investigate the tight-knit village community which houses Lydon hall. And everyone one they meet seems suspicious. First published by Collins Crime in 1991, this book's original title is For Sale — With Corpse. 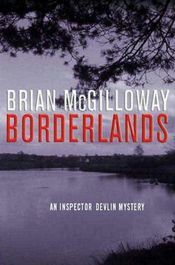 MystereBooks is pleased to feature Borderlands by Brian McGilloway, now available at a special price, courtesy of the publisher, Minotaur Books. The ebook format of this title was priced at $2.99 from the listed vendors (below) as of the date and time of this post (04/30/2014 at 5:00 PM ET). Prices are subject to change without notice. The price displayed on the vendor website at the time of purchase will be the price paid for the book. Please confirm the price of the book before completing your transaction. Winter 2002. The corpse of local teenager Angela Cashell is found on the Tyrone-Donegal border, between the North and South of Ireland, in an area known as the Borderlands. Garda Inspector Benedict Devlin heads the investigation. 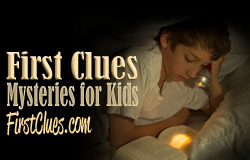 The only clues are a gold ring placed on the girl's finger and an old photograph, left where she died. While Devlin searches for the girl's killer, her father has his own ideas about who is responsible — and his own ideas about how to make them pay. Meanwhile, Devlin becomes reacquainted with an old flame eager to rekindle their affair. Then another teenager is murdered, and Devlin unearths a link between the recent killings and the disappearance of a prostitute twenty-five years earlier — a case in which he fears one of his own colleagues is implicated. 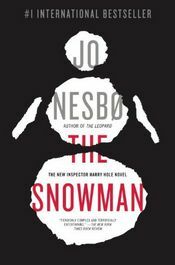 As a thickening snow storm blurs the border between North and South, Devlin finds the distinction between right and wrong, vengeance and justice, and even police officer and criminal becoming equally unclear. Deadly Arrangements by Annie Adams is the second mystery in this cozy Flower Shop series featuring florist Quincy McKay. The trouble is, between Alex's job and planning weddings, it's getting harder and harder for Quincy and Alex to find any time to themselves. Every time the flames of passion ignite between them, someone or something shows up to fizzle the fire, including her meddling mother, her formerly absent father and even Elma, the handsiest waitress in the West. Wedded bliss is contagious in small town Hillside. Should be great news for Quincy, except that one groom is missing and another is the prime suspect. Hard for a florist to make a living that way, and even harder for her to stay out of the investigation, especially when the suspect is her sidekick, K.C. 's fiancé. Just when she thinks nothing else could go wrong, a ghost from Alex's past comes back to haunt them both, which could keep them apart forever, if someone doesn't kill Quincy first. 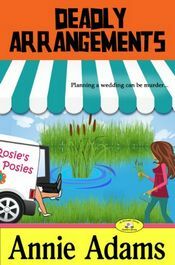 She's stumbled into the clues to solve the case of the missing groom and finds a corpse as well, proving that planning a wedding can literally be murder. Every so often Amazon releases a new selection of Kindle books priced up to 85% off as part of The Big Deal Promotion. 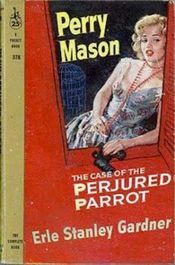 Today's featured mystery, suspense, or thriller title is The Case of the Perjured Parrot by Erle Stanley Gardner. This Kindle book was listed at $0.99 as of the date and time of this post, Wednesday, April 30, 2014 at 4:00 PM ET, and should be available at this price through Sunday, May 11, 2014. Did Wealthy Fremont Sabin divorce his wife before his untimely death? That's the multimillion-dollar question. And the right answer will mean a windfall for either the deal man's angry son or headstrong widow. Each has accused the other of destroying Sabin's will — and murdering Sabin. But with no document declaring to whom the affable eccentric intended to leave his fortune, Perry Mason faces a prickly puzzle. Even more puzzling, however, is the talking parrot. Casanova was Fremon Sabin's beloved pet. But the bird found at the crime scene proves to be a foul-mouthed impostor. Suffice it to say that more than a few feathers will be ruffled as Mason sets out to clip a clever killer's wings. 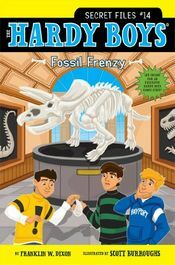 We are pleased to present you with one of this month's new First Clues: Mysteries for Kids books: Fossil Frenzy by Franklin W. Dixon, a The Hardy Boys: The Secret Files Mystery. For more information about the book, which is recommended for readers aged 7 to 9, see a synopsis, below. At the dig, fellow classmate Tico uncovers an old dinosaur tooth — even though Tico's biggest competition in the club, Aisha, claims she found it first. And when Tico realizes his tooth is missing — a tooth that turns out to be immensely valuable — all signs point to Aisha. But is she really the culprit? It's up to Frank and Joe to dig deep for the answers in a case that is bigger than they ever imagined! In twenty-first century L.A, the truth is always more interesting than tabloid gossip. But when 14-year-old Hugo Vine tries to hire private-eye Thomas Kyd, Thomas is not sure he wants know the truth about the famous Vine family. A recovering alcoholic still haunted by a terrible crime he committed in Vietnam involving a child, Kyd refuses to work for a minor who is apparently mentally unbalanced. Months later, Hugo's mother, Sally, hires Kyd against his will to keep a close watch on Hugo. Thrown together with the boy on a daily basis, Kyd discovers Hugo's life is haunted by the possibility his real father was murdered by the man who replaced him. Even worse, Hugo's own mother may have played a role in his death. Kyd must test the limits of his own courage and humanity to save Hugo from the deadly web in which he's been caught. 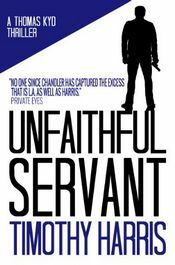 And he must resolve to be an unfaithful servant. 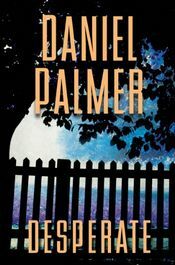 Today's new hardcover mystery title, scheduled to be published during April 2014 by Kensington, is Desperate by Daniel Palmer. 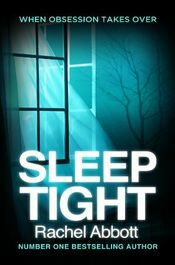 Today's featured mystery, suspense, or thriller title is Sleep Tight by Rachel Abbott. This Kindle book was listed at $0.99 as of the date and time of this post, Wednesday, April 30, 2014 at 2:00 PM ET, and should be available at this price through Sunday, May 11, 2014. But her car is in the garage, and her purse is in her handbag — on the kitchen table. The police want to issue an appeal, but for some reason every single picture of this family has been removed from albums, from phones, from computers. And then they find the blood. Has the past caught up with Olivia? Two families — the Railtons in Britain and the Farthings in America — are at the heart of a titanic political struggle, their fates intertwined in the secret world of Intelligence by blood, love, loyalty and betrayal. 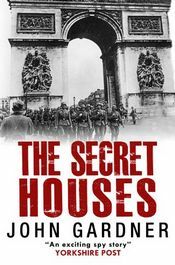 The British Secret Intelligence Service and the American Office of Strategic Services are locked in a desperate struggle to destroy the war machine that threatens the future of the world — and once again the Railtons and the Farthings are drawn into the secret struggle. This sequel to The Secret Generations was first published in 1987. MystereBooks is pleased to feature Hunt the Wolf by Don Mann with Ralph Pezzullo, now available at a special price, courtesy of the publisher, Mulholland Books. The ebook format of this title was priced at $2.99 from the listed vendors (below) as of the date and time of this post (04/30/2014 at 1:00 PM ET). Prices are subject to change without notice. The price displayed on the vendor website at the time of purchase will be the price paid for the book. Please confirm the price of the book before completing your transaction. 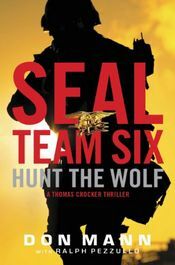 In the midst of a grueling training exercise, Thomas Crocker, USN, unearths a pocket of terrorism that leads straight from the slopes of K2 to the cities of Europe and the Middle East. Crocker and his team, who are trained for the most intense kinds of combat in the most extreme environments, must blaze through a perilous web of terrorist cells to track down a ruthless sheikh who is running an international kidnapping ring before his captives pay the ultimate price. 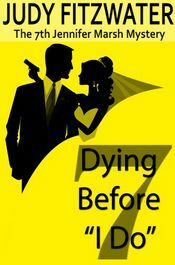 Dying Before I Do by Judy Fitzwater is the seventh mystery in this series. All of Jennifer Marsh's writer friends — Leigh Ann, Teri, April, and Monique — plus Emmie Walker and Muffy are back to help Jennifer plan her wedding and solve the mystery as bullets, arrows, and poison threaten to derail it. Love and murder: two words that should never go together. But when Jennifer and long-time beau Sam Culpepper finally decide to tie the knot, murder rears its ugly head to intervene. Now Jennifer has more to contend with than choosing colors and flowers for the most important day of her life. She and Sam must thwart whoever is bent on keeping the secrets of an old kidnapping case. 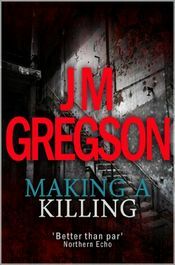 One man is dead, and young reporter Teague McAfee is next in line. Jennifer finds herself embroiled in a twisty tale of love gone wrong, while dodging her friends who are determined to give Jennifer and Sam the perfect wedding. Hole suspects a link between a menacing letter he's received and the disappearance of Jonas's mother — and of perhaps a dozen other women, all of whom went missing on the day of a first snowfall. As his investigation deepens, something else emerges: he is becoming a pawn in an increasingly terrifying game whose rules are devised — and constantly revised — by the killer. We are delighted to welcome back thriller writer Christopher J. Yates to Omnimystery News. Christopher first visited with us earlier this month, when we discussed his new thriller Black Chalk (Random House; April 2014 trade paperback and ebook formats), and today we're pleased to feature an excerpt from it, the opening paragraphs. Don't worry, he says. I promise you, it'll be fun. It'll be fun. Pause. Click. Yes, that's what we said about the Game all those years ago. It'll be so much fun! I hold the phone to my chest for some time after the call has ended. And then, crossing the room, I open my curtains for the first time in three years. Because now he has found me, tracked me down, and there remains no good reason to stay hidden any longer. For three cloistral years the quantity of time I have spent inside this apartment has averaged twenty-tree hours and fifty-nine minutes each day. I am a hermit, as pale as my bones, as hairy as sackcloth. But now I intend to grow stronger. I must ready myself for the impending visit of the ancient friend. Because the timing of the call was of course no coincidence. In five weeks' time, fourteen years to the day since last we saw each other, this hermit turns thirty-four. And let me state from the outset that, whether I win or lose, I hope this story will serve as my warning to the world. A cautionary tale. My confession. Christopher J. Yates was born and raised in Kent and studied law at Oxford University before working as a puzzle editor in London. He now lives in New York City with his wife and dog. 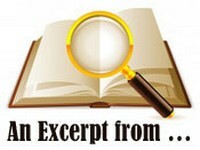 To learn more about the author and his work, please visit his website at ChristopherJYates.com or find him on Facebook and Twitter. One game. Six students. Five survivors. It was only ever meant to be a game played by six best friends in their first year at Oxford University; a game of consequences, silly forfeits, and childish dares. But then the game changed: the stakes grew higher and the dares more personal and more humiliating, finally evolving into a vicious struggle with unpredictable and tragic results. Now, 14 years later, the remaining players must meet again for the final round. Who knows better than your best friends what would break you?